Move over Henrik and Daniel, Eric and George have arrived! While it may be a few more years until Eric and George Morgan Calder reach the NHL (and the Sedins have already retired! ), the 12 year old twins are off to an excellent start in expanding their young hockey careers with a trip to Europe this summer. 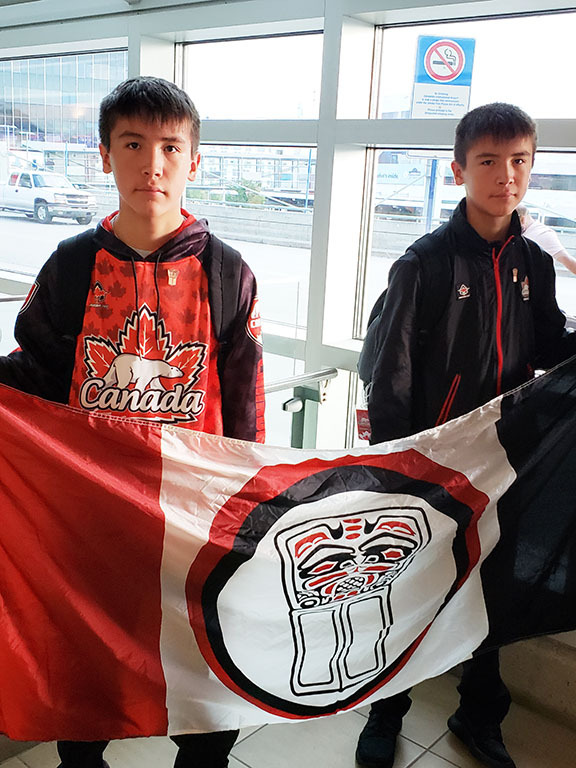 The young Nisg̱a’a duo, who reside in Prince Rupert, were scouted while playing hockey at a Prince George tournament earlier this year. The European tour will take Eric and George to Italy, Austria, Germany and Czech Republic to play hockey representing Canada on the ’Canada Bears’ team. While they may be naturally talented on the ice, it was no easy feat earning the money necessary to get them and their mom Bobbi there! So they hit the ground running with fundraising efforts over the last several months. Eric and George also made application and were sponsored in part by NLG’s Sports and Recreation Fund. Eric and George are the sons of Bobbi Morgan and Gord Calder and hail from the G̱anada tribe from Wilps Haym̓aas. Si’aamhl wilsim̓ Eric and George, the Nisg̱a’a Nation is rooting for you!